Dog Playpen By Kousi Reviews – What are the Pros & Cons? 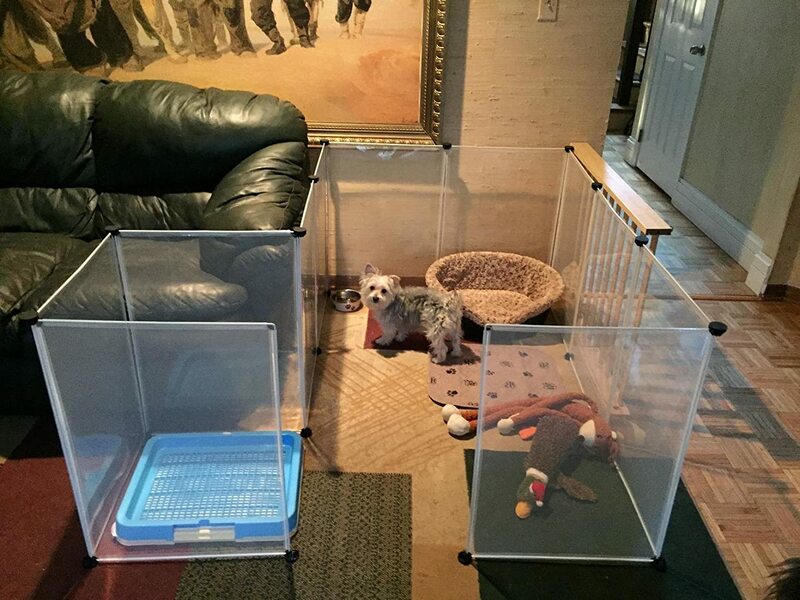 Dog Playpen by Kousi is good looking and affordable transparent playpen. But, is it worth buying? What are the pros and cons of buying this beautiful dog playpen? These are some of the things we will explore here together. In addition, I have also compared it with one of the ‘best playpens’ for your dog. So please check it out below before you make a buying decision. The highlights given above has already given you some idea, and I am going to cover all these in the review. Honestly speaking, dog playpen by Kousi is one of the most attractive dog playpens that I have come across but it definitely has a downside. So let’s dive in and explore. The good thing about the dog playpen by Kousi, it is made out of plastic, so it can be washed and cleaned easily. As you can see in the picture it has transparent panels. I haven’t seen many dog playpens which has this beautiful feature. Yes it is safe because it is made out of plastic. So it does not have any sharp edges or anything like that. This is usually a problem with wired and metal playpens. It is awesome if you like minimal design. This dog playpen has a neat design, so it will nicely fit in with your home decor. It may be suitable for small dogs; let’s say about 14 inches in height. But I would say it is more a good choice for rabbits, cats and other small pets. It encloses about twenty eight square feet of space. So I think that’s not too bad for your small dog. First of all, this dog playpen by Kousi has twelve plastic panels, which effortlessly fits together in no time. So it is easy to put it together and handy if you want to move it around your home. The panels have inter-locking arrangement, which also makes it flexible to fit into various shapes and angles. I have already mentioned it is easy to put it together and when needed you can easily dismantle it as well and store it in a safe place for future use. It is cheap, so expect reasonable quality. I think for the price you will get a decent product. Honestly it looks good, no doubt about that. But after going through various reviews I will be cautious if I was buying it. I always look at the reviews by buyers who have ‘verified purchase’ status. One of my friend uses it for her small dog – she has absolutely no problems. But she has such a well-behaved and calm dog. As I said above it is definitely good for smaller pets. You will be absolutely fine. But if you are thinking about even small dogs with high energy – you might want to explore a little more before you buy this. The only reason I say this, there are other awesome options available to you. Just a heads up: Iris Pet Playpen with 24-inch Door is awesome so you might want to check out my review here or read the reviews at Amazon below. (1) First of all, dog Playpen by Kousi may be suitable for small pets such as rabbits. Yes it may work for a puppy as well. Only thing to keep in mind is that, as a puppy grows they will have more energy, right. Will this playpen hold together? Now if your dog is well-disciplined and good with boundaries they will be fine with this dog playpen. (2) People have complained about the quality of material. At the time of writing this article there were 45% 5 star rating and 20% 1 and 2 star rating. (3) Stacking it on top of the other is a problem, but you can easily extend it using the flexible panels. My Suggestion: Weigh the pros and cons of Dog Playpen by Kousi and Iris Pet Playpen with Door 24-inch high panel both before buying anything. Finally, let’s move on and conclude this review. Overall it is a good dog playpen, but I have already mentioned the pros and cons. I wish the company takes pro-active steps to improve product quality, and I say this because the design is awesome. So make the right choice after weighing it based on your needs and requirements. Take care, and I hope you found this article useful. See you soon. Kousi was started about six years ago in China and then it ventured into the US market. It has grown significantly since than. I would not say their products are excellent quality. You get what you pay, their products are priced very competitively.